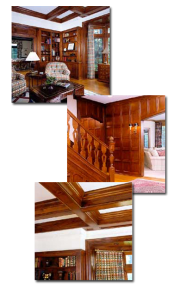 In addition to the services we offer at our own location, we also offer complete, on-site furniture refinishing and restoration of molding, wood panels, staircases, doors, pianos, pool tables or any other woodwork in your own home. Rather than moving your built-in or oversized pieces, we’ll come to you. Our professional restoration and refinishing services for elevator cabs, wood panels and architectural millwork keep your elegant pieces looking their best. For high-quality refinishing in the region, Gomillion is your best source for expert work. We work with prestigious owners and management companies of leading facilities, and we have wide expertise in elevator-cab restoration and other jobs that require specific knowledge. Whether on-site we provide on-site millwork restoration at your location or in our workshop, Gomillion carefully plans the work schedule to utilize its comprehensive services to complete the project in a timely manner, while minimizing disruption to our customers. We are leading experts in the field with more than 30 years of experience and a rock-solid record on prestigious projects. Our craftsmen professionally finish new panels, and we meticulously restore, touch-up or refinish existing panels to revitalize all the wood surfaces and metal trims to their original brilliance and beauty. With our powerful, charcoal-activated air filtration system to keep your home or business free of dust and fumes and our minimal-disruption scheduling (including evenings and weekends), you will find our on-site refinishing and restoration service more convenient and effective than you may have thought possible. To preserve the flawless condition of your furniture, our Appearance Maintenance Program provides routine repair and touch-up work on a regular basis in your office or home.